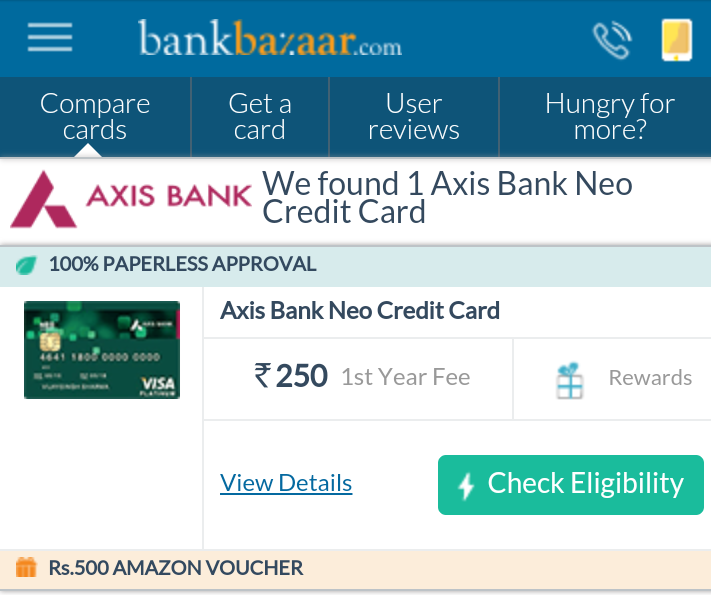 Home Bank Apply for Axis Bank Neo Credit Card on Bank Bazaar Website – Paperless Approval Available. 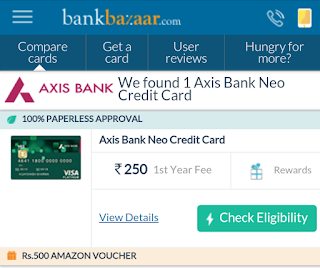 Apply for Axis Bank Neo Credit Card on Bank Bazaar Website – Paperless Approval Available. ▪ 1st year joining fee is Rs 250. ▪ You get Rs 500 Jabong voucher + Rs 300 BookMyShow Voucher as Joining Benefits From the card. ▪ You also get Rs 500 Amazon voucher from Bankbazaar for applying to this card on their site. Net gain = Rs 1,050. ▪ That's not all, if you manage to spend Rs 2,500 on this credit card within the first 45 days, the joining fee of Rs 250 will also be waived! 10% off / cash back on select spends on Jabong, Myntra, Redbus, Bookmyshow, Freecharge etc. And many more benefits.